Late Friday afternoon we received good news. Densho's application to the national Japanese American Confinement Sites grant program was awarded in the amount of $112,500. The money will pay for 40 new video interviews with people who can speak about the 10 WRA mainland camps as well as detention sites in Hawaii. The new interviews will focus on camps less well documented in Densho's and others' collections (for example, Jerome, Arkansas, pictured). We're starting to research new interviewees now. 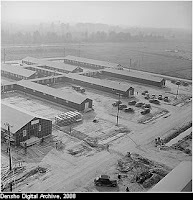 If you know of good potential "narrators" of the World War II detention camps (not necessarily Japanese American speakers), submit your suggestion online: See the Densho narrator criteria and nomination form. Read more about Densho's grant here. It's administered through the National Park Service. If we're fortunate, Congress will appropriate the full $38 million that was authorized while there's still time to capture the life stories from our Nisei elders.